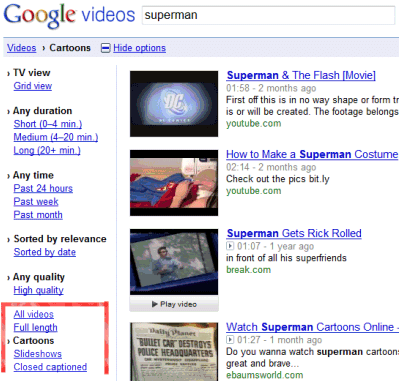 Google Video has a new feature that lets you restrict search results to cartoons and slideshows. After performing a search, click "Show options" and select "Cartoons" or "Slideshows" from the list of options. Google uses a video recognition technology that tries to classify videos, but the accuracy is far from impressive. Unfortunately, Google's video search engine ruined the "TV view" feature that allowed you to play videos without opening a new page. YouTube videos are no longer played in the embedded player, while the other videos are played on the search results page only if you click on "Play video". you are giving very nice post dear. i could see a lot of posts of your blog. i found it very useful. Unbelievable! I loved the TV View feature, and now it's no different than any other type of search! Ugh!